There are lots of children every where who would love to dress up as their favorite Monster High character and you can choose to buy or make them the appropriate costume, but when it comes to the hair you really do need to get a Monster High wig. So much of the Monster High characters ‘looks’ comes from their wigs that you really can’t leave it out. Frankie Stein loves black and white stripes for instance and that really comes out with her hair whereas Lagoona Blue’s hair makes her seem like a mermaid with the interwoven ocean blue color in it. Whether you’re complimenting your own home made Monster High costume of you’re adding to a brought costume let’s finish it off in style with one of these official Monster High wigs. If you’re dressing up as Abbey Bominable you want to make sure you add lots of fur and the other thing you’re going to need is a wig. This is an official Monster High Abbey Bominable wig which is fashioned on Abbey’s cool hair. The wig hair is white with streaks of blue, pink and purple in it and an attached white faux fur headband which is far, far from abominable! Combine this with an outfit that has a lot of faux fur on it and some Abbey Bominable style make up and you’ll have created a costume that everyone will be jealous of. Complete Your Perfect Clawdeen Wolf Costume in Style! Clawdeen Wolf’s wig is long and brown in color with contrasting red streaks in it (quite wolf like in fact!). Her hair is long, wavy and volumous – it’s basically the type of hair that makes girls everywhere jealous. This wig isn’t just about the hair though as it also has Clawdeen’s ears attached to it and those ears are accented with gold hoop ear-rings (gold is her favorite color after all). With this wig on her head your little princess can walk and act with the confidence that Clawdeen Wolf herself was born with. As a self-confessed ‘fierce fashionista’ you could hardly expect Clawdeen to own only one outfit. With this in mind let your daughter wear something that she thinks Clawdeen would wear, throw on the wig and you have nearly completed your perfect Clawdeen Wolf costume. If your daughter wants to look like this Egyptian princess then you’ll need to get her this Cleopatra inspired wig. The wig is black in a long bob style with a full fringe and metallic gold foil streaks running through it. The wig also has an attached gold headband with blue stones attached. This wig is the ultimate touch to help your child act arrogant and bossy like her ‘idol’ Cleo De Nile. 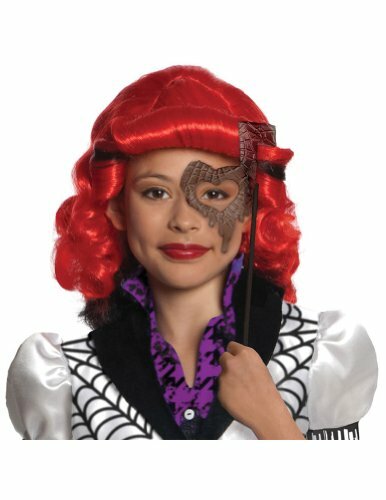 If your little girl has decided that she needs to dress up as Draculaura then she’s going to need her freaky fantastic wig. The nearly 1600 year old daughter of Dracula has black hair with pink streaks through it. Her hair is straight and worn in pigtails with bangs. 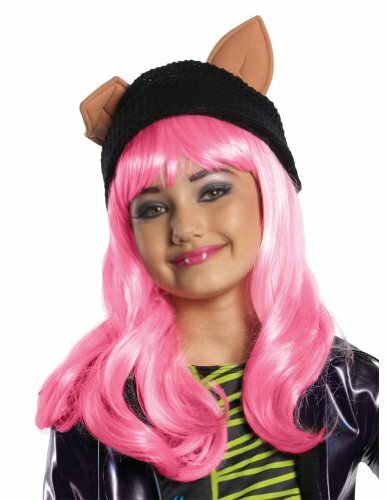 Draculaura loves to add a little pink to black when it comes to her wardrobe so if you’re trying to put together a costume for this Monster High student bear that in mind, add this wig and put together her make up and you’re done. If your child wants to dress up as Frankie Stein then this Monster High wig is an absolute must have accessory. The wig captures Frankie’s long black and white hair do to perfection – I especially like how the stripes in her hair are highlighted by having her bangs tied back like in this wig. Now all you need to do is buy a plaid dress (Frankie loves plaid), pop on some make up and you have the perfect Frankie costume! Ghoulia’s hair is certainly one that you notice! 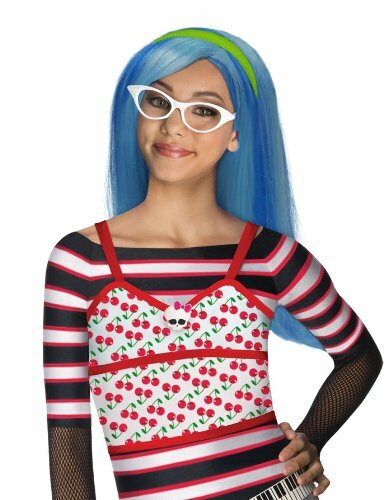 This officially licensed Monster High wig has her long blue hair with blue streaks in it made to perfection and also includes her favorite green headband. What could be better for any little fan of Ghoulia Yelps than her very own Ghoulia wig? Complete any Howleen costume with the cute pink wig that captures the look of Clawdeen’s youngest and extraverted sister. This is a perfect addition to the official Howleen costume or any ‘were-punk’ style of outfit that you’ve made to emulate this fun little Monster High ghoul. 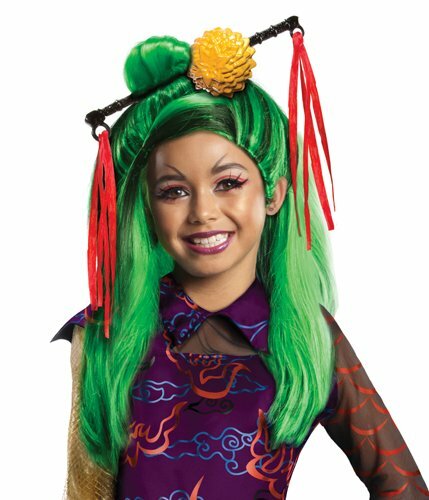 A Chinese dragon this fiery Monster High School student is instantly recognizable when you add her wig (and a tail) to any outfit whether it’s her usual attire or not. Her long black and green hair is arranged in an ancient Chinese style called a Fa Ji (basically hair worn in a bun or coil). This wig would look great with the official costume which depicts Jinafire’s own take on modernizing a traditional Hanfu style dress or with a homemade outfit in her favorite fashion colors of royal red and jade green. Lagoona Blue’s wig is one that a mermaid would be envious of – long, platinum blonde and curly as though she had been spending her days sunning on a rock by the sea! Her blonde tresses have streaks of aqua blue through them which look gorgeous and also compliment the blue fins that can be found in her wig. There’s also a pink floral accent in the wig which off sets the blonde and aqua combination really well. 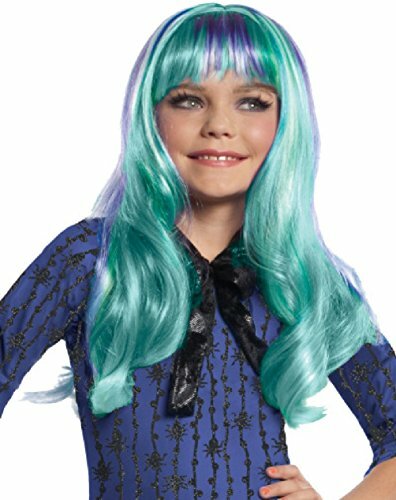 This official Monster High wig is essential to pull off a really cool Lagoona Blue costume. Once you have Lagoona’s wig you just need to assemble a costume that the ocean princess would approve of (try to add a little ocean blue into it as that’s her favorite color) and then work on her make up. How to Get A Cool Lagoona Blue Face – The Make-Up Tutorial! This gorgeous wig is the bright red of Operetta’s hair and one of the things that makes her really stand out in a crowd. I love the way her hairstyle evokes the 1940s with the use of victory rolls, when you combine this hair with her sense of style however it brings it right into this millennium. This wig perfectly captures the black and orange (sorry I should say marigold!) colors in Skelita’s hair. 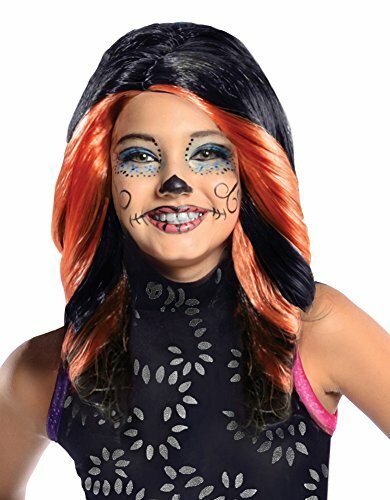 No one can doubt who you are if you wear this wig and have skeleton tights and gloves on and sugar skull inspired make up on your face. Now Skelita’s actual hair is a lot longer than this wig, but I think this wig is still a perfect way to complete the look of this fun loving Monster High student. As you can see Spectra’s wig is long straight and very purple – the color of royalty no less! Her dark purple hair has highlights in a lighter purple and this mane of hair really makes Spectra stand out – something she’s very happy about! When it comes to creating a Spectra Vondergeist costume you have to make sure that it’s made from light material for floating around in, but add some metal as she likes to be able to rattle (she does come from a family of ghosts after all!) around. If your daughter has a fairy, ballerina or princess costume preferably with a handkerchief hemline then you might be able to turn that into a Spectra costume by adding a few chains and then adding some inexpensive grey plastic shower ring hoops to a black belt to give the illusion of a metal belt. Twyla’s gorgeous hair is a pale green with blue and purple stripes that cascades down her back and around her shoulders just like this wig does. It’s hard to imagine that someone with hair as beautiful as this can be shy, but luckily Twyla has Howleen Wolf as one of her best friends and she makes sure that Twyla doesn’t miss out on any fun. This wig would be perfect to finish off the officially licensed Twyla costume or even for you to wear over your own Twyla outfit. Simply don a pair of pale grey/silver or white tights and wear it over a dress in dark blue or black with accents in the pastel green of her hair. Like many of her fellow students at Monster High she really suits a tutu style skirt, but as long as it’s feminine she’ll love it as she does look quite the ‘little lady’ most of the time. This entry was posted in Costumes, Wigs and tagged monster high costume ideas by Lou. Bookmark the permalink.